The capacity of time-hopping pulse position modulation (PPM) and pulse amplitude modulation (PAM) for an ultra-wideband (UWB) communication system is investigated based on the multipath fading statistics of UWB indoor wireless channels. A frequency-selective fading channel is considered for both single-user and multiple-user UWB wireless systems. A Gaussian approximation based on the single-user results is used to derive the multiple access capacity. Capacity expressions are derived from a signal-to-noise-ratio (SNR) perspective for various fading environments. The capacity expressions are verified via Monte Carlo simulation. Ultra-wideband (UWB)  communication systems employ ultrashort impulses to transmit information which spreads the signal energy over a very wide frequency spectrum of several GHz. Multipath fading is one of the major challenges faced by UWB systems. 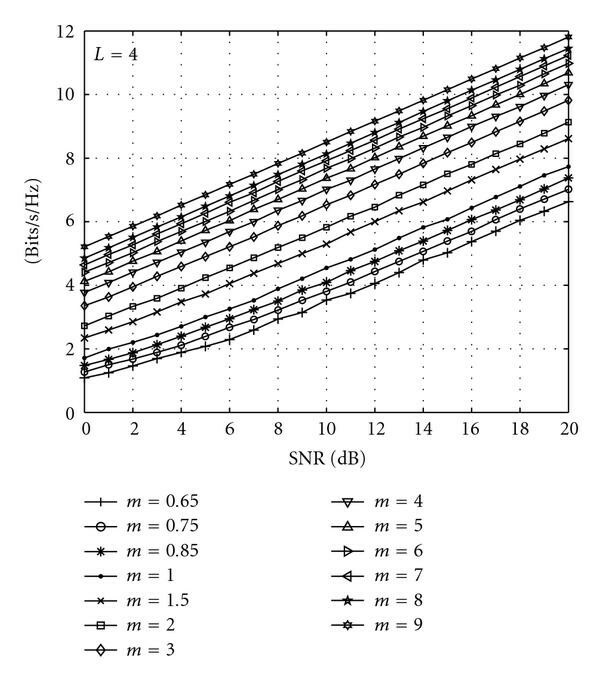 The statistics of narrowband indoor wireless channels have been extensively investigated and several widely accepted channel models have been developed. However, narrowband models are inadequate for the characterization of UWB channels because of their extremely large transmission bandwidth and nanosecond path delay difference resolvable paths. Considering these characteristics, the so-called POCA-NAZU model and the stochastic tapped-delay-line (STDL) propagation model have been proposed for UWB indoor wireless channels [2, 3]. The parameters of the STDL model were obtained from channel measurements. It was shown that the Nakagami distribution is a better fit for the indoor wireless magnitude statistics rather than the distributions typically used in narrowband systems. Recently, the IEEE 802.15.4a group presented a comprehensive study of the UWB channel over the frequency range 2–10 GHz for indoor residential, indoor office, industrial, outdoor, and open outdoor environments . It was suggested that small-scale fading be added based on the well-known Saleh-Valenzuela model. A list of parameters for different environments was also presented in . Although the channel model presented in  describes the UWB indoor channel in more detail than the STDL model, it is difficult to use for capacity and performance analysis because of its complexity. In addition, it is not suitable for deriving general results which can be very useful to system designers. Therefore to facilitate and simplify the analysis, we employ the STDL model in this paper to study the capacity of a UWB system with PPM and PAM over indoor fading channels. Extensive research has been conducted on the capacity of UWB systems in both AWGN and fading channels. In [5, 6], the channel capacity of UWB systems with M-ary pulse position modulation (PPM) is examined, and this is extended to biorthogonal PPM (BPPM) and pulse position amplitude modulation (PPAM) in [7, 8]. PPM and PAM with receive diversity are considered in . However, these results are based on the assumption of an additive white Gaussian noise (AWGN) channel without considering multipath fading. 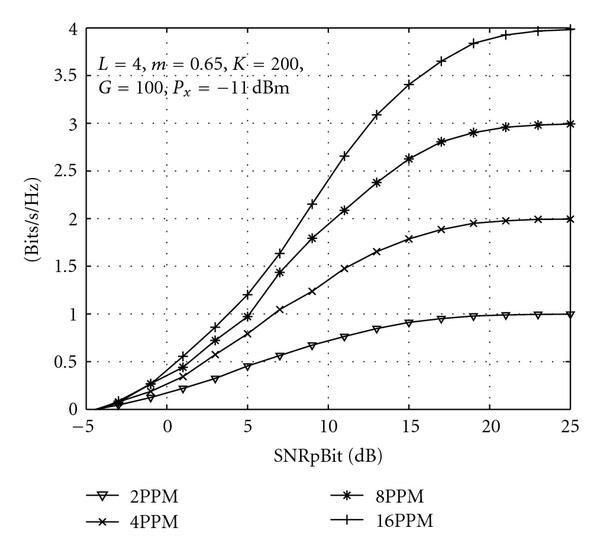 In the following sections, we extend the analysis in [7–9] to derive the capacity of a UWB PPM and PAM system over indoor fading channels for both single and multiple user environments from a signal-to-noise ratio (SNR) perspective. The rest of the paper is organized as follows. 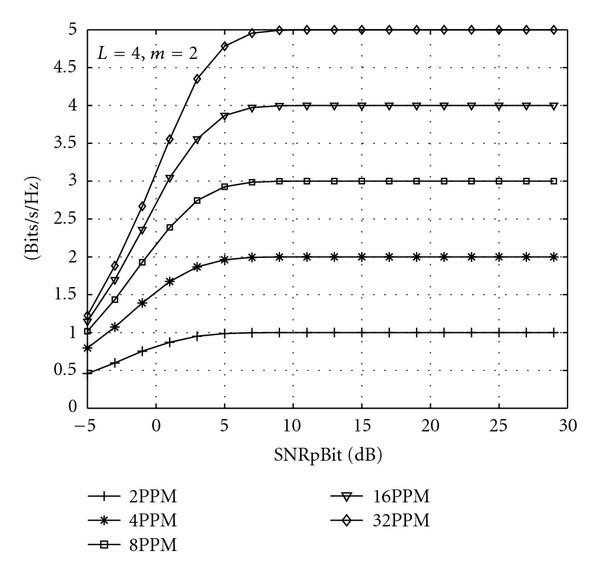 In Section 2, the time-hopping PPM and PAM UWB systems are introduced and a statistical model for the UWB indoor multipath channel is described. Section 3 presents the capacity analysis of PPM and PAM UWB systems over indoor fading channels with a single user. The discussion also covers frequency flat fading channels. The relationship between reliable communication distance and channel capacity subject to FCC Part 15 rules is given. The multiple access capacity of PPM and PAM UWB systems is analyzed in Section 4 via a Gaussian approximation. Numerical results are presented in Section 5 for the capacity over indoor fading channels. Finally, some conclusions are given in Section 6.
where is the signal amplitude, represents the transmitted impulse waveform that nominally begins at time zero at the transmitter, and the quantities associated with are transmitter dependent. is the frame time, which is typically a hundred to a thousand times the impulse width resulting in a signal with a very low duty cycle. Each frame is divided into time slots with duration . The pulse shift pattern , (also called the time-hopping sequence), is pseudorandom with period . This provides an additional shift in order to avoid catastrophic collisions due to multiple access interference. The sequence d is the data stream generated by the k th source after channel coding, and is the additional time shift utilized by the N-ary pulse position modulation. If , a repetition code is introduced, that is, pulses are used for the transmission of the same information symbol. where is AWGN with double-sided power spectral density , K is the number of simultaneous active users, is the received pulse waveform, L is the receive diversity order, that is, the number of resolvable paths in the case of a single-input single-output (SISO) system, and is the time-varying attenuation. For an AWGN channel, if only one user is present, the optimal receiver for PPM is a bank of M correlation receivers followed by a detector. When more than one link is active in the multiple-access system, the optimal PPM receiver has a complex structure that takes advantage of all receiver knowledge regarding the characteristics of the multiple-access interference (MAI) . However, for simplicity, an M-ary correlation receiver is typically used even when there is more than one active user. For PAM, only one correlation receiver is required for both the single user and multiuser cases. The receivers used for an AWGN channel can also be applied to multipath fading channels subject to the channel state information being fully available to the receiver for equalization. where t is the observation time, L is the number of the resolvable paths, is the arrival-time of the received signal via the l th path which is log-normal distributed , is the random time-varying amplitude attenuation, and denotes the Dirac delta function. Without loss of generality, we define so that . 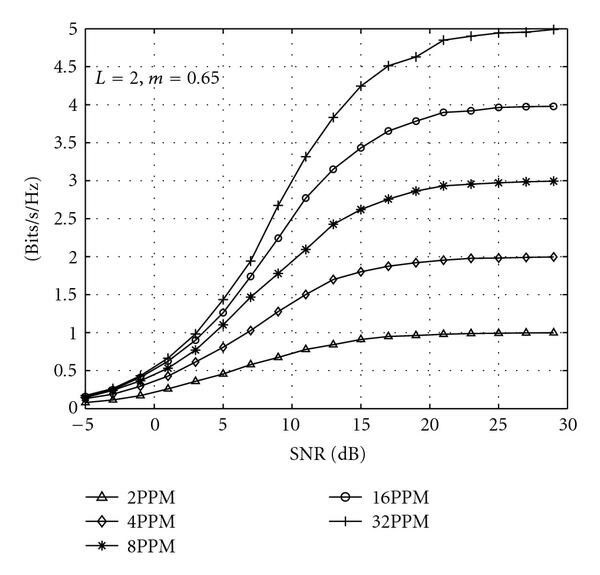 For narrowband systems, the number of scatterers within one resolvable path is large, so that the central limit theorem can be applied, leading to a Gaussian model for the channel impulse response. However, UWB systems can resolve paths with a nanosecond path delay difference, hence the number of scatterers within one resolvable path is only on the order of 2 or 3 . Since the number of scatterers is too small to apply the central limit theorem, the distribution of cannot be modeled as Gaussian. Although the exact distribution of is difficult to derive, several models have been proposed [2, 3] considering that a small number of scatterers best describes the indoor wireless channel. In , the so-called POCA-NAZU model is introduced to describe the small scale multipath fading amplitudes for UWB signals, while  derives a STDL propagation model from experimental data. It is shown in  that the Nakagami distribution is the best fit for the indoor small-scale magnitude statistics. where denotes the Gamma function, = , and , which is a function of l and . Note that . As , it is reasonable to assume that the power of is exponentially decreasing with increasing delay. To make the channel characteristics analyzable without affecting the generality of the channel, we further define as a random variable that takes the values +1 or with equal probability, and as a deterministic constant within the resolvable path time interval defined by , where and W is the signal bandwidth. where denotes and denotes . where is the symbol SNR of the UWB system. This shows that the equivalent SNR can be denoted by the symbol SNR modified according to the number of paths and the fading coefficients. For frequency-selective fading, and (14) will be evaluated via Monte Carlo simulation since it is difficult to derive a simple closed form expression. Although (14) is calculated based on a specific pulse shape, the standard capacity expression has continuous inputs and continuous outputs. Therefore considering this restriction, (14) does not represent the exact channel capacity, but it does provide guidance and a means of comparison from the capacity perspective. where , and are Gaussian random variables with distributions N(0,1) and , respectively. The expression N(x,1) denotes a Gaussian distribution with mean x and variance 1. Monte Carlo simulation can be applied to (17) to evaluate the channel capacity of a UWB PPM system over frequency-selective channels. where is one of the normalized M-ary PAM signals, and w is AWGN with zero mean and variance 1 in each real dimension. where is the equivalent processing gain, is the bandwidth of the UWB impulse related to the pulse duration Tp, is the thermal noise floor, calculated as the product of Boltzmann's constant, room temperature (typically 300 K), noise figure, and bandwidth. F is the noise figure, is the wavelength corresponding to the center frequency of the pulse, and n is the path loss exponent. It is easily shown that the maximum reliable communication distance is determined primarily by the signal-to-noise ratio . Based on (17), (18), and (19), the maximum distance for reliable transmission of a PPM or PAM UWB system can be calculated. The relationship between system capacity and communication range will be demonstrated in Section 5. The equivalent SNR, , can be substituted into (17) and (18) and then averaged over the PDF of to obtain the corresponding capacity with L-order receive diversity. With more than one user active in the system, multiaccess interference (MAI) is a major factor limiting performance and capacity, particularly for a large number of users. As shown in [8, 9], the net effect of the multiple-access interference produced by the undesired users at the output of the desired user's correlation receiver can be modeled as a zero-mean Gaussian random variable by invoking the central limit theorem. This allows the capacity analysis given in Section 3 for a single user to be extended to a multiple-access system. To evaluate the average SNR over the time-hopping sequences and propagation delays, we make the following reasonable assumptions to simplify the analysis. , for , where K is the number of active users, and the noise , are all assumed to be independent. The time-hopping sequences are assumed to be independent, identically distributed (i.i.d) random variables uniformly distributed over the time interval . For simplicity and without loss of generality, we assume that each information symbol only uses a single UWB pulse, that is, . Results for other values of Ns can easily be obtained. All M- ary PPM or PAM signals are equally likely a priori. The time delays are assumed to be i.i.d uniformly distributed over . Perfect synchronization and channel equalization are assumed at the receiver, that is, is known at the receiver. where = is the time difference between user 1 and user k. Under the assumptions listed above, can be modeled as a random variable uniformly distributed over [ , ]. With the Gaussian approximation, we require the mean and variance of (28) to characterize the output of the cross-correlators. Note that although a Gaussian approximation for the MAI of a UWB time-hopping PPM system may not always be accurate , it can still be used to provide meaningful results that are useful for comparison purposes. where is the processing gain of the UWB system. for PPM and PAM, respectively. The instantaneous capacity for a multiple access UWB system with PPM or PAM can be obtained by substituting from (35) in (17) or (18), respectively. The channel capacity can then be obtained by averaging the instantaneous capacities over the joint PDF of . In this section, some numerical results are presented to illustrate and verify the analytical expressions obtained previously. Figures 1 and 2 show the capacity of the multipath fading UWB channel with continuous inputs and outputs with and , respectively. This shows that the capacity increases as m increases, and can achieve a higher capacity than for the same SNR. Note that the capacity for is almost equal to the 1.5 m, capacity. UWB multipath fading channel capacity with . Figure 3 shows the capacity of a UWB system with PPM over multipath fading channels, with and , while Figure 4 gives the capacity for and . Obviously, the larger L and m, the greater the capacity. Capacity of a UWB system with PPM over a multipath fading channel with and . Figure 5 presents the relationship between reliable channel capacity and the communication range subject to FCC Part 15 rules. The link budget model in (18) is applied and the channel parameters are , , and . This shows that PPM can provide full capacity only within 2m in most cases. However, less than half of the capacity can be achieved when the communication distance is extended to 10m over a fading channel. In general, a UWB system can only provide reliable transmission over very short or medium ranges with the restriction of FCC Part 15 rules and a multipath fading channel. 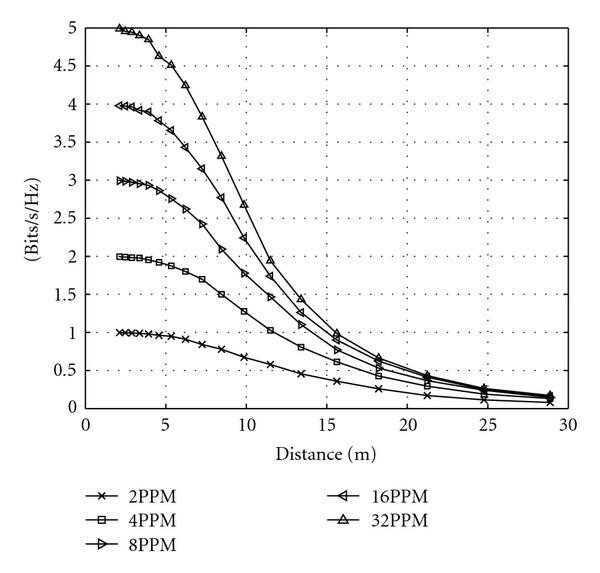 Relationship between distance and channel capacity of a UWB system with PPM over a multipath fading channel, , , and . 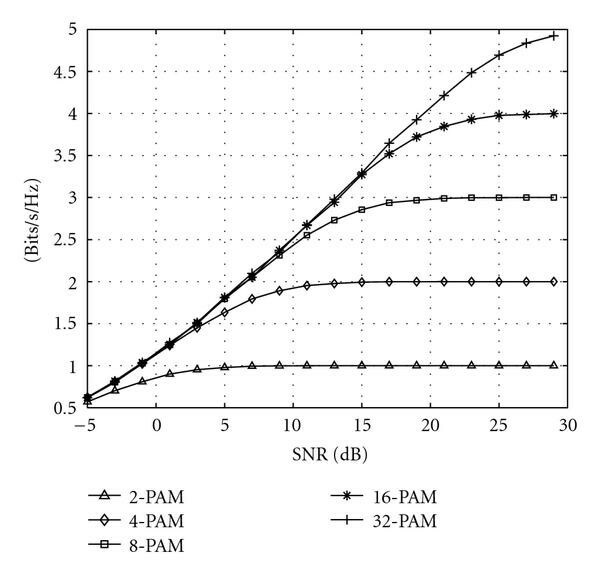 Figure 6 shows the capacity of PAM over a multipath fading channel with and . The capacity of a multiple access UWB system with PPM and PAM over a multipath fading channel with , , , , and dBm is shown in Figures 7 and 8, respectively. 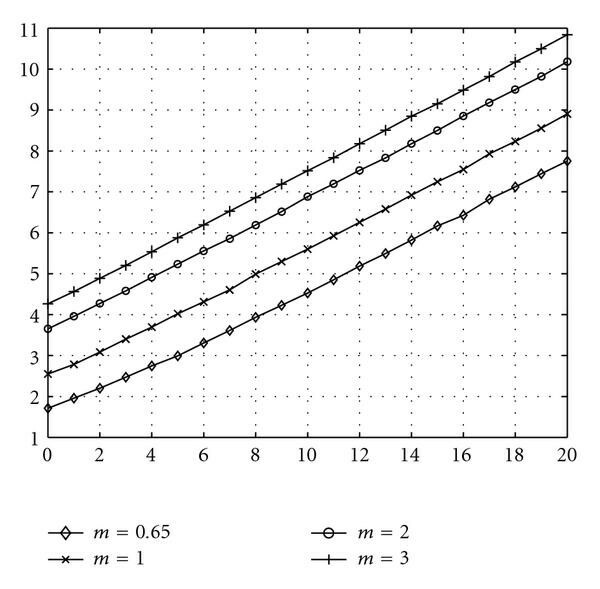 The relationship between the number of users and the capacity of a PPM UWB system is demonstrated in Figure 9. This shows that the system can only achieve less than half the capacity with 10 simultaneous active users. Capacity of a UWB system with PAM over a multipath fading channel with and . Capacity of a multiple access UWB system with PPM over a multipath fading channel with , , , , and dBm. Capacity of a multiple access UWB system with PAM over a multipath fading channel with , , , , and dBm. 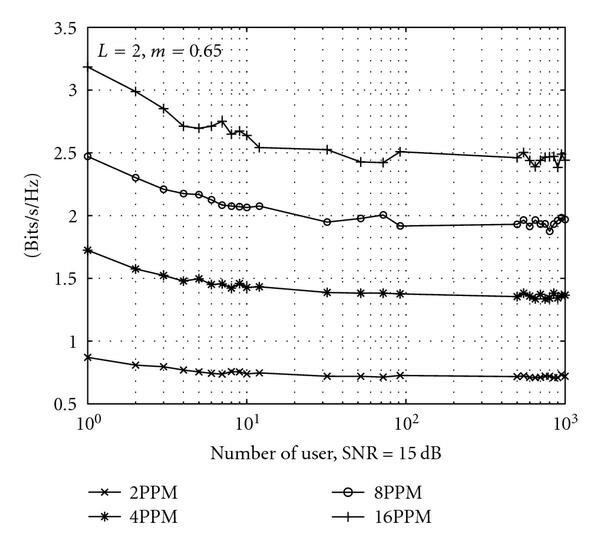 Relationship between channel capacity and number of users for a multiple access UWB system with PPM over a multipath fading channel, , , , dBm, and SNR = 15 dB. The capacity of UWB PPM and PAM systems over multipath fading channels has been studied from a SNR perspective. The capacity was first derived for an AWGN channel and then extended to a fading channel by averaging the SNR over the channel random variables. Both single and multiple user capacities were considered. Exact capacity expressions were derived, and Monte Carlo simulation was employed for efficient evaluation. It was shown that fading has a significant effect on the capacity of a UWB system. This work is supported by National 863 Hi-Tech Research and Development Program of China under Grant no. 2007AA12Z317 and Science & Technology Developing Program of Qingdao, China under Grant 06-2-3-19-gaoxiao.